Janet "Jay" Weis, age 91, of Casper, passed away September 8, 2018 at Life Care Center of Casper surrounded by her loving family. Janet was born January 6,1927 in Minneapolis, Minnesota to Arthur and Stella (Gutekunst)Hanson. She married Norman Weis in Minneapolis on June 2, 1951. In 1958 she and Norman moved to Casper where he began teaching at Casper College and she was a secretary for the architectural firm of Bob Wehrli. 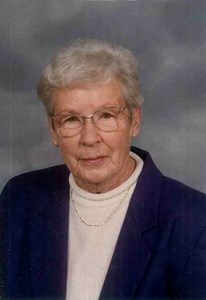 She was a homemaker for most of her life, a member of Shepherd of the Hills Presbyterian Church where she served on the Deacon Board and sang in the choir. For many years she volunteered at Interfaith and the League of Women Voters of Natrona County. Janet enjoyed gardening, music, traveling, and spending time with her dogs. In addition to her parents, she was preceded in death by her loving husband of 49 years, Norman Weis, her sisters Bernice Hanson and June Burmeister. She is survived by her son, Wade(Lynne) Weis, granddaughter Schlee Weis, grandson Shawn (Amanda) Weis, great-granddaughters Allie Weis and Sarah Weis, great-grandson, Jack Weis, niece Charlotte(Craig) Smith, and other nieces and nephews. A memorial service is set for 1:00 pm Saturday, September 22, 2018 at Shepherd of the Hills Church. Memorials can be made to Shepherd of the Hills Presbyterian Church Deacons Fund. Add your memories to the guest book of Janet Weis. I am very sorry for your family’s loss. Isaiah 41:10 highlights God’s promise to support you during this difficult time and He will strengthen you as you draw closer to him in prayer. May you also draw comfort from the memories you shared with Janet as we patiently wait to see our loved ones again. John 5:28,29.